Kate's Kreations: Dining room walls! Life as a Christian, a Mother, a Grandmother, a wife, a crafter, a quilter, a seamstress, a gardener, whew!!! While my husband is driving today I thought I would share some of my latest "kreations"! This is the wall in my dining room! The quote boxes I created. (My husband makes the boxes and I paint them.) You can find similar ones on my Etsy site or contact me for details to make your favorite verses/quotes into a box. The flower pictures I found at TJ Maxx on clearance! The triple vase wall hanging I found at Jo-Ann Fabric. The shelf and design in top middle I found at Hobby Lobby! The crosses and angels were given to me as presents over the years! We hope to make some of the barbed wire and nail crosses to sell in the near future! 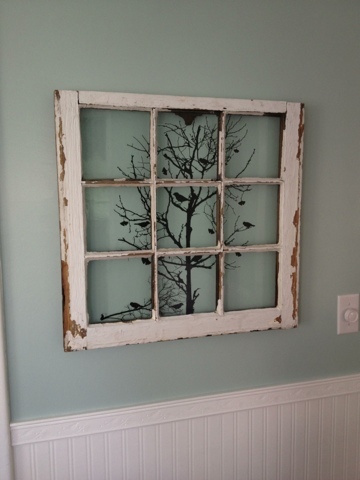 This is an old window that came out of our house. I found the wall art at Hobby Lobby. I cleaned the window with a scrub brush and reinforced the windows and removed the glaze that was loose. I cut the wall art to fit and placed it on wall first. 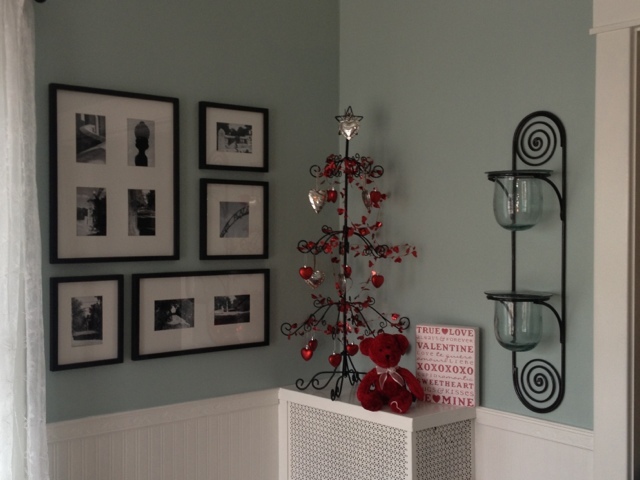 I like to use the Command removable picture hangers and I was able to hang this window with 4 of them! This is the corner of my house that is decorated for season... Even if the rest of the house isn't decorated! I bought the ornament display tree from Improvements Catalog! I bought the decorations for each holiday from Hobby Lobby and Dollar Tree. The Quote Box is something I make and can be found in my Etsy shop! The candle holder on the wall is something we have had for years. I spray painted it black. The pictures are black and whites of our historic neighborhood where we live! The frames were wood frames, bought at Sears, and I spray painted them black. Until next post, may God Bless you and keep you! 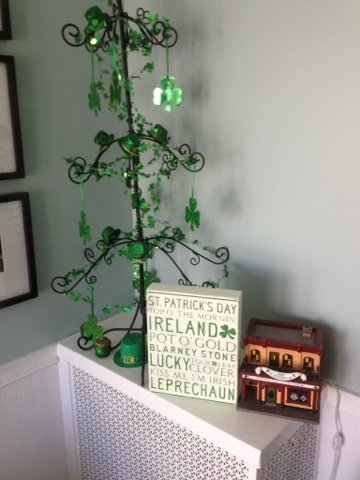 I love how you used the ornament display tree to showcase your Valentine's Day and St Patty's Day decorations. Great idea! Full Time Grandma first and foremost. I have an old house full of Grandkids and projects. Home decor, Sewing and Crafts have always been a passion of mine. I have been sewing since I was 7 years old and crafting about as long. 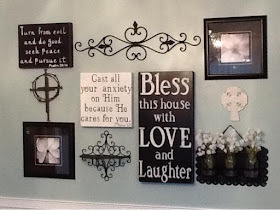 I will be sharing my Christian faith, my grandchildren, my adventures, my decorating ideas, my crafts and things I have for sale on these pages ... you may also find me on Etsy.